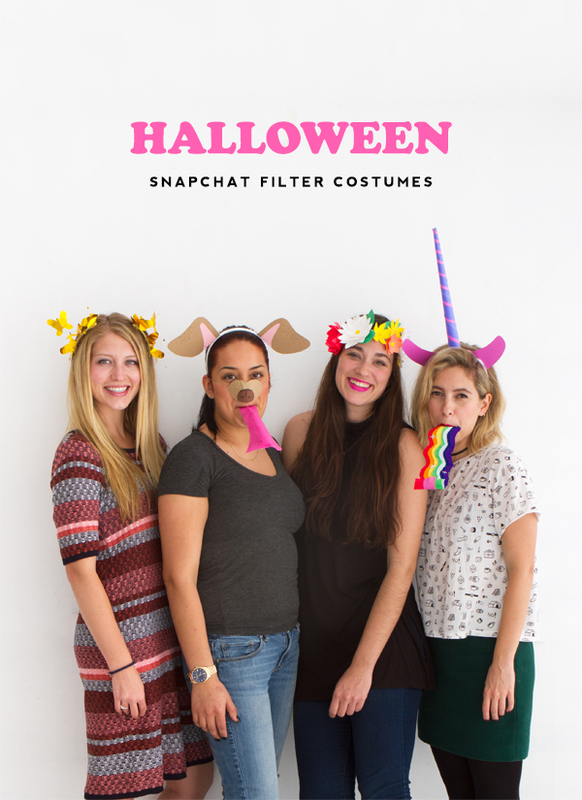 When Jordan came up with the brilliant idea to create Snapchat Filter Halloween costumes, we knew we had to drop everything and get to work on it instantly!! Looking at the finished photos now, I realize that some may mistake these costumes for digital filters – but they are 100% real! No joke. Even down to the rolling tongue and rainbow which we fashioned out of party horns! Read on for more pics and details on how to create them! Step 1: Cut a piece of red crepe paper 12” long and 2” wide. Then, trim one long end to have a squiggly edge. Step 2: Cut a piece of clementine crepe paper to the same dimensions. Trace the squiggly shape from the red paper, then cut it out. Repeat with all remaining colors. Step 3: Glue the crepe paper together in rainbow order so that the squiggles run parallel to one another. When you finish gluing down the purple, trim the end to match the original squiggle shape. Step 4: Cut little x’s from the silver crepe paper and glue to the rainbow shape for a little sparkle. Step 5: Roll the party blower out (tape the horn to your countertop using loops of tape to keep it extended). 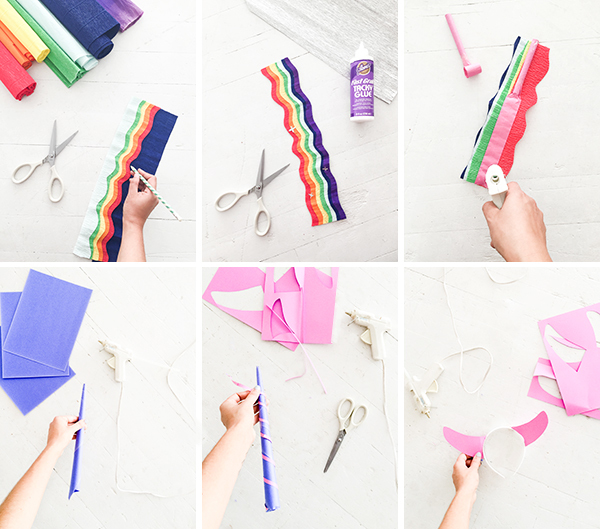 Apply hot glue along the center of the party blower and glue the crepe paper rainbow in place. Let dry completely. When you remove the tape, the horn should roll up! Step 6: Cut a long piece of purple cardstock and roll into a tall unicorn horn shape. Apply glue to the edge to hold in shape. Cut thin strips of pink and glue in a spiral around the horn. Step 7: Cut ear shapes from the pink cardstock. Fold a small tab along the bottom edge and hot glue the ears to opposing sides of the plastic headband. Glue the horn in the center, and hold until cool. Step 1: Create eight double-sided origami sheets by gluing the backs of two individual sheets together. Step 2: Fold the double-sided sheets in half. Then, cut out eight butterfly shapes, using the fold to create a mirror image. The butterflies should be between 2”-4” tall. Cut small 1/4″ dots from the remaining double-sided scraps. Step 3: Cover the exposed edge of the hair combs with gold ribbon and glue to hold in place. Step 4: Tie gold wire to a few individual teeth of the combs, leaving the ends exposed. Add a dab of hot glue to the ends of the wire and attach the gold dots. Leave one wire exposed on each comb. Step 5: Glue three gold butterflies to the ribbon on each comb, then glue the smallest of the butterflies to the remaining exposed wire so that it floats above the rest. Step 6: Place the combs on either side of your hair, adjust the wire dots to your liking, and you’re all set! Step 1: Cut out floppy ear shapes from light brown cardstock. Use the pink cardstock to add the inner ear detail. Stipple dots on the top of the ear to add shading. Step 2: Fold the bottom of the ear to create a tab. Apply hot glue to the tab and adhere to the plastic headband. Step 3: Cut a long tongue shape from the pink crepe paper. Roll the party blower out (you can use loops of tape on your countertop to keep the horn extended). Apply hot glue along the center of the party blower and affix the crepe paper tongue in place. Trim left over crepe paper. Step 4: Cut a jelly bean shape from the light brown, a nose from the brown, and nose details from the dark brown cardstock. Glue the pieces together. Stipple shading. Step 5: Make two vertical cuts on the snout shape to the base of the nose. 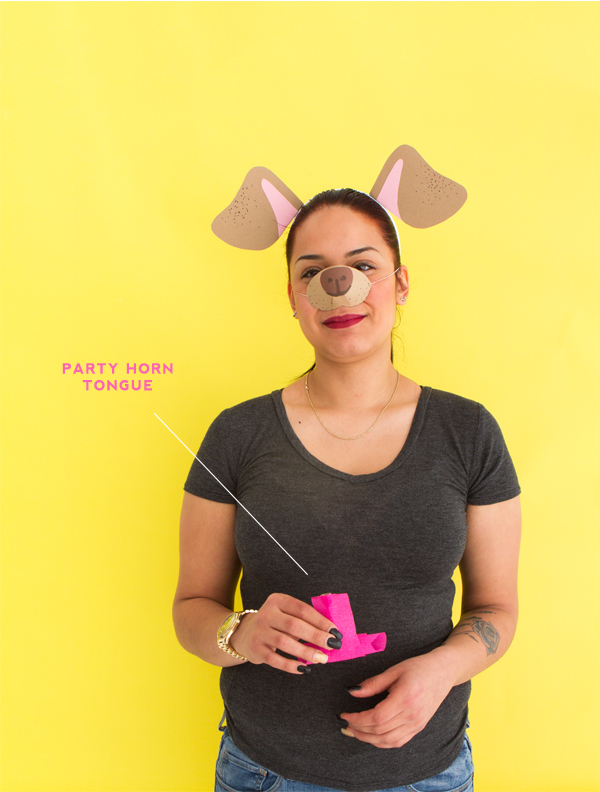 Tuck the ends in and glue in place so that you have a three-dimensional snout shape. Step 6: Cut a piece of elastic about 10” long. Knot both ends, and staple in place on either side of the snout. Step 1: Cut out the flower shapes and three green leaves. For the three big white daisies, you’ll want to cut out three round shapes, each one smaller than the one before it. Cut pointed scallops along the edges, stack together and glue in place. Add a round yellow dot to the center and curl the petals inward with a pencil. For the yellow daisies, cut a single round shape about 2-1/2″ in diameter. Cut pointed scallops along the edges and add a small, mustard dot to the center. Curl the petals inward. For the two fuller flowers, cut individual petals out from the pink and coral sheets and curl with a pencil. Starting from the center, layer the petal together until you have a large, full flower, gluing each petal in place. Step 2: Cut a piece of ribbon about 3’ long. Starting from the center, glue the flowers and leaves to the ribbon. When in doubt, refer to your Snapchat filter for reference! You guys. THESE. ARE. AWESOME. Totally doing this. I love this idea, great idea Jordan!!! Totally with the trends now, clever! Hilarious! 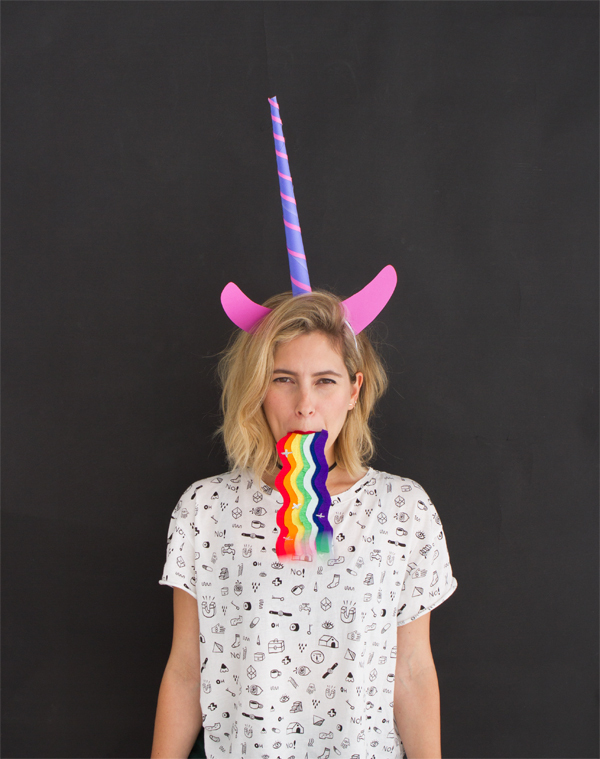 I love the unicorn! Love seeing these faces after meeting you and seeing your great work in action last week! fantastic pictures and so funny…!